A horrific incident took place earlier this week at Abner Clay Park in Virginia. 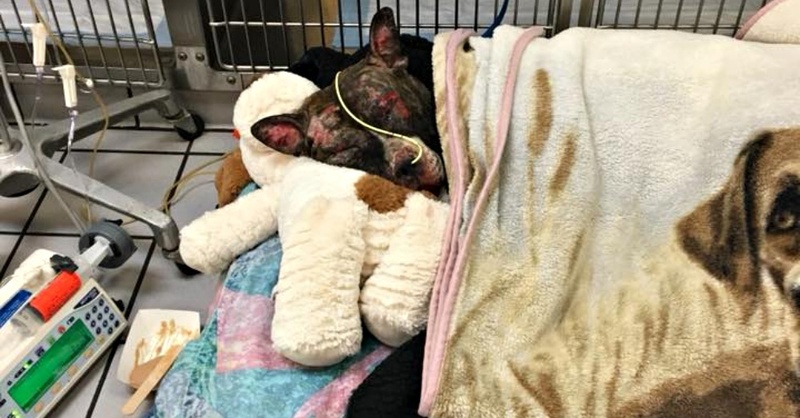 A cruel owner tied a pit bull to a pole and set the dog on fire on purpose. The poor dog was discovered with harsh burns covering almost 40% of his body. The pit bull was rushed to the veterinarian by Richmond Animal Care and Control after he was discovered. The non-profit organization posted about the incident online to raise awareness about the incident. The shelter has named the dog Tommie and pleaded with their followers on social media to help raise money to cover his expensive medical costs. Amber Carter works for the Virginia Veterinary Centers as a veterinary assistant. She posted about her meeting with the pit bull on her social media profile. Amber said that the dog showed her nothing but kindness and love. He just wanted someone to return the affection. Thousands of concerned citizen have been sharing Tommie’s story. There have already been many donations to cover the cost of the operations that Tommie will need. A $10,000 has also been posted to encourage people to find the man responsible for the awful acts. Although Tommie has made some small improvements within the past few days, he is still in critical condition. There is a tiny chance that this poor pit bull will not be able to survive the damage and trauma that the flames caused his body. This sweet dog has thousands of people that hope he pulls through. The shelter is continuing to provide their followers with updates on Tommie’s situation. The latest update mentioned that Tommie was in stable condition. However, new wounds were appearing and causing new problems. The shelter was changing their course of action for treatment. The investigation to find the person responsible for this horrific act is still ongoing. Witness reports suggest that the perpetrator was a male who was wearing several layers of pants. He was seen running from the park after the incident.